The First Rule of Punk is a wry and heartfelt exploration of friendship, finding your place, and learning to rock out like no one’s watching. 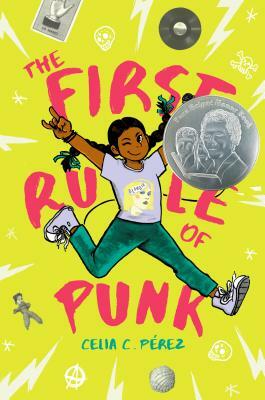 Celia C. Pérez is the award-winning author of The First Rule of Punk, a 2018 Pura Belpré Author Honor Book. Celia is a longtime maker of zines inspired by her love of punk music and writing. Her favorite zine supplies are a long-arm stapler, glue sticks, and watercolor pencils. She'll never stop picking cilantro out of her food at restaurants, and she owns two sets of worry dolls because you can never have too many. Originally from Miami, Florida, Celia lives in Chicago with her family where she works as a community college librarian. "A charming debut about a thoughtful, creative preteen connecting to both halves of her identity." "Those who enjoy vivacious, plucky heroines... will eagerly embrace Malu." "Pérez’s debut is as exuberant as its heroine... A rowdy reminder that people are at their best when they aren’t forced into neat, tidy boxes." "Extremely relatable and creatively inspiring, with a voice that is equal parts witty and sharp." "Malú is an irrepressible force, one that readers will long remember."